Legend holds that, before they built on the surface, the earliest Orcs made their homes underground. True or not, this cavern has an undeniably Orcish feel to it. 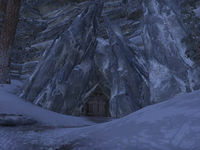 Morkul Descent is an unmarked cave to the east of Icy Shore Wayshrine. It is guarded by ogres and durzog. Atypical Artistry: Help an artist create a masterpiece of native ogre art. Corgrak's Cairn: Find the helm of a fallen warrior.